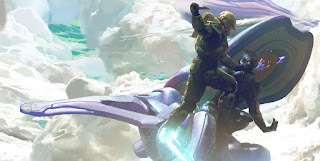 Fangirl Review: Dark Horse Announces All-New Halo Anthology! Dark Horse Announces All-New Halo Anthology! Collection of new stories based on the epic Halo universe coming this fall! 343 Industries and Dark Horse Comics are set to release a brand-new Halo® graphic novel anthology based on the massive video game franchise later this year. Halo: Tales from Slipspace will feature all-new stories from some of the comic industry’s best—including Jonathan Wayshak, Eric Nguyen, Alex Irvine, Kody Chamberlain, Dave Crosland, John Jackson Miller, Jonathan Goff, Simon Roy, and Halo: Escalation writer Duffy Boudreau—as well as 343 Industries’ own Franchise Creative Director Frank O’Connor and Franchise Producer Tyler Jeffers. This action-packed anthology is essential reading for all Halo fans! 343 Industries and Dark Horse have also produced two blockbuster comics series with canonical story lines written by writers from the video game franchise (Halo: Initiation and Halo: Escalation) and will rerelease the graphic novel Halo: Fall of Reach in March. Halo: Tales from Slipspace is in stores October 12, 2016.